It was the spring of 2013 when the Point Lookout Yacht Club (PLYC) in Point Lookout, NY was introduced to WindCheck magazine and the Summer Sailstice. After reading the June issue, with all of the creative events others were organizing, it inspired us to celebrate the longest day of the year as well. As we often spend time sailing and enjoying the sunsets on the water, it only made sense to coordinate an event for this special day. As so many others, our community was hit hard by Superstorm Sandy, and boats returned to the marina later than usual, if at all. For the PLYC, Summer Sailstice was symbolic as it served as a new start to the season. Morale was high as we took advantage of every minute of daylight with good friends and great food complimented by a glorious sunset. So, with no surprise, and back by popular demand, Summer Sailstice has been included in our 2014 club calendar and will continue as a club tradition. There were many great ideas published in last year’s June issue, which inspired us for another new club event. Last year, we honored the original members who started the PLYC in 1977 with a special race. The “Founding Fathers Regatta” was organized as a scavenger hunt. Crews set sail with a list of objects to locate and photograph throughout the race. Points were awarded and the top three captains with the highest accrued points were presented with special trophies. It was a great day for the club and for the members. Truly, good fun! On behalf of the Point Lookout Yacht Club, I’d like to thank WindCheck for including us in this issue and for the information, camaraderie and inspiration throughout the year. Wishing everyone a fun and safe sailing season ahead! Editor’s note: The 14th Annual Summer Sailstice will take place on waterways around the world on Saturday, June 21. Sailors everywhere are invited to participate in this global celebration of sailing by sailing ‘together’ regardless of where they are or what they sail. 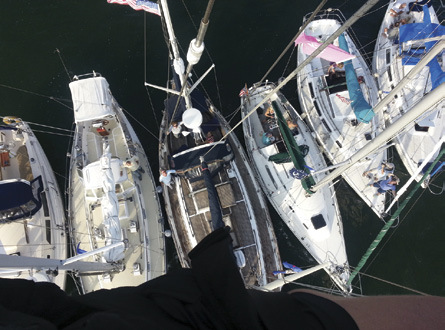 Founded by John Arndt, the Associate Publisher of Latitude 38 Magazine, Summer Sailstice connects more than 19,000 sailors all over the world – cruisers, racers and recreational – to celebrate life under sail. By joining an event, or just sharing your own Sailstic plans, you’ll be entered to win one of dozens of prizes including a $5,000 Footloose Sailing Charters gift certificate, a Hobie kayak, a stand-up paddleboard and much more. To register, create a Sailstice event, post stories and see what activities are planned around the planet, visit SummerSailstice.com.